Welcome to the nation's largest and only organization representing African-American physicians. 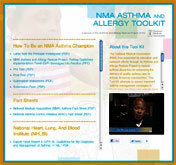 The National Medical Association (NMA) makes every effort to provide you with the most current and accurate information available on asthma. If that means you or your family members suffer from asthma, we're here to help you manage your problem. How? By providing the information you need with suggestions about where you can go for help, what treatment is available, and what you can do to manage your or your family members' asthma and concerns. While we cannot replace medical treatment and professional individualized care, we do provide information you and your physician can use as a supplement to your care. So see your doctor and stay informed through NMA. Take the Asthma Control Test Now!